I’ve been sitting on this for weeks and am SO EXCITED to FINALLY announce that I am working with Clorox to promote their new ‘If Mom Had Three Minutes’ program. If you are a mom… you TOTALLY GET THIS! If only we had more time, right?. I say that almost every single day of my life. But we all have tips and tricks to get through the chaos – that’s what makes us MOMS. 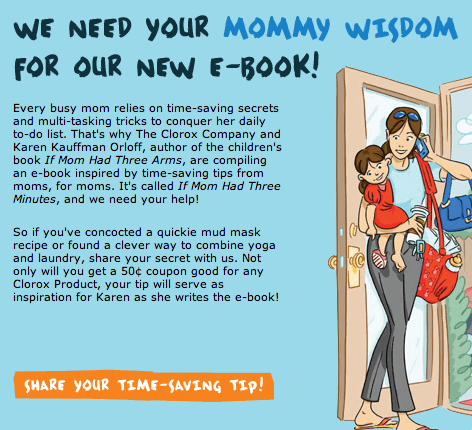 The Clorox Company and children’s book author Karen Kaufman Orloff are working together to create an e-book with time-saving tips inspired by moms called… If Mom Had Three Minutes. You know you have some secret tips too!! Head on over to the If Mom Had Three Minutes tab on Clorox’s Facebook page and provides one of your own time-saving tips. By doing so, you will receive a $.50 coupon good for any Clorox product! Your tip will also help inspire the e-book mentioned above. Seriously, don’t you love the concept! I am honored to be working on this program. *I am being compensated by The Clorox Company to talk about my favorite time-saving, multi-tasking tip(s) as part of the If Mom Had Three Minutes program. Previous Post: « FIRST LOOK: Gap Teams Up With Diane von Furstenberg For GapKids / babyGap Collaboration!